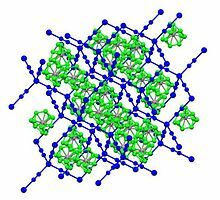 A clathrate is a chemical substance consisting of a lattice that traps or contains molecules. The word clathrate is derived from the Latin clatratus meaning with bars or a lattice. Traditionally, clathrate compounds are polymeric and completely envelop the guest molecule, but in modern usage clathrates also include host–guest complexes and inclusion compounds. According to IUPAC, clathrates are "Inclusion compounds in which the guest molecule is in a cage formed by the host molecule or by a lattice of host molecules." Cd(CN)2·CCl4: Cadmium cyanide clathrate framework (in blue) containing carbon tetrachloride (C atoms in gray and disordered Cl positions in green) as guest. Hofmann compounds are coordination polymers with the formula Ni(CN)4·Ni(NH3)2. These materials crystallize with small aromatic guests (benzene, certain xylenes), and this selectivity has been exploited commercially for the separation of these hydrocarbons. Metal organic frameworks (MOFs) form clathrates. 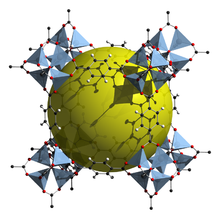 MOF-5, an example of a metal organic framework: the yellow sphere represents the guest cavity. ^ Pearce, Fred (27 June 2009). "Ice on fire: The next fossil fuel". New Scientist (2714). pp. 30–33. Archived from the original on April 13, 2016. Retrieved July 5, 2009. ^ Ellis-Davies, Graham C. R. (2007). "Caged compounds: Photorelease technology for control of cellular chemistry and physiology". Nature Methods. 4 (8): 619–628. doi:10.1038/nmeth1072. PMC 4207253. PMID 17664946.